It might be the only way to survive in Washington today. 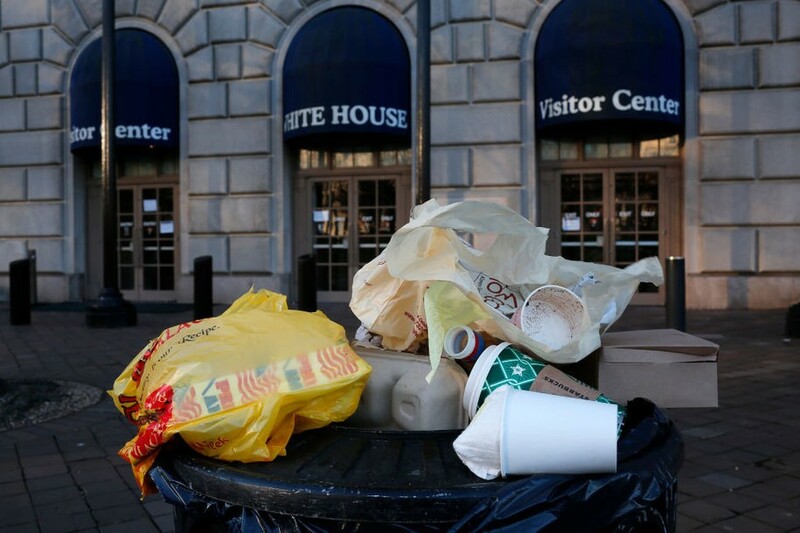 Uncollected garbage piling up outside the White House Visitor Center is just a symbol of the garbage inside the White House itself. Make no mistake: Donald Trump’s decision to throw temper tantrums and keep the government shut down until he gets his $5.7 billion border wall is hurting people. And the shutdown is going to hurt a lot more people before it’s over. The worst-off, of course, are those employees who won’t get paid and are genuinely fearful about their ability to make a rent or mortgage payment. They’re worried about how they’ll afford groceries in the coming weeks to feed their families. They wonder where they’ll find the money for school fees. Whether those nearly 800,000 people are furloughed or forced to work without pay, it’s all the same — there won’t be money for necessities. There are stories about workers starting GoFundMe pages to pay rent. At least the Coast Guard was embarrassed enough to take down its online tip sheet suggesting that employees hold yard sales or babysit to make ends meet. But sooner or later, we’re all going to feel the effects of the Trump shutdown, one way or another. Those who don’t depend on the government for a paycheck might not realize how cutting off government services when employees aren’t around can affect all of us. Whether it’s curtailing a visit to a national park, waiting in a long line to board a plane, or worrying whether the food you buy at the grocery store is safe, this Trump shutdown is starting to mean inconveniences and hardships for many Americans. The Center for American Progress issued an analysis that put the amount of missed paychecks at $2 billion every two weeks. That’s a lot of money to remove from the economy, even for a short time. As the shutdown continues, it will get worse. “By the White House’s own estimate — which is lower than some outside forecasts — this shutdown will likely reduce quarterly U.S. GDP by 0.1 percent every two weeks that it continues,” the analysis estimated. Since first-quarter GDP is projected to be roughly $5 trillion, Trump’s shutdown will cost the U.S. economy $5 billion in lost output every two weeks it continues based on the administration’s own impact estimate. That’s $2.5 billion per week, $357 million per day, or $15 million per hour. An estimate reported in Politico was lower — $1.2 billion a week. But that could be enough to have ripple effects throughout the economy, such as lowering the country’s credit rating and causing an overall economic slowdown. It’s tough enough for families of government workers. But those withheld funds also mean businesses where those workers would usually spend money are hurting, too. No federal workers buying lunch at a local deli. No families going out to dinner. No trips to the movies. No purchases at local stores and malls. Whole communities feel the effects. We know that Smithsonian museums in Washington, D.C., are closed. We’ve all seen photos of garbage piling up on the National Mall and at national parks, even as groups of Muslim youths are volunteering to take care of that trash. Seven people have died at national parks since the shutdown began, as there is little supervision for visitors. Some parks, like Joshua Tree National Park in California, have closed their gates rather than risk more human injury and damage to the parks themselves. Food safety. The Food and Drug Administration oversees about 80 percent of the nation’s food supply. With workers furloughed, the FDA “has suspended all routine inspections of domestic food-processing facilities,” according to a story in The Washington Post. The FDA typically conducts about 160 inspections a week, and a third of those are done at high-risk facilities. The Center for Science in the Public Interest, a nonprofit advocacy group, described the inspection reductions as unacceptable. Foodborne illnesses are a major problem in the United States, sickening 48 million people each year and killing 3,000, the Centers for Disease Control and Prevention estimates. The safety net. Poor Americans count on government assistance for a variety of services, and those services are getting cut off. Whether it’s nutrition programs, housing subsidies, or low-interest housing loans through the government doesn’t matter; many are on hold. Staffing for Food and Nutrition Services, which oversees the Child Nutrition Programs, SNAP, and WIC [Women, Infants, and Children], has been cut by 95 percent since the shutdown began. Already, more than 2,500 grocers and other retailers are no longer accepting food stamps because their SNAP licenses were not renewed before the shutdown started Dec. 22, according to the Food Marketing Institute, an industry group. Federal funding has also been shut off for cash welfare benefits, known as Temporary Assistance for Needy Families (TANF), for 3.4 million of the poorest Americans, the majority of whom are children. It’s not just food; it’s also housing. If the government does not fully reopen by Feb. 1, nearly 270,000 rural families who receive federal rent subsidies through the Agriculture Department would also be at risk of eviction because their landlords would no longer be paid, said Bob Rapoza, executive secretary of the National Rural Housing Coalition. And another 100,000 low-income tenants are already at risk because HUD did not have staff in place during the shutdown to renew at least 1,150 affordable housing contracts that expired in December. That means apartment owners will not be paid and must now dip into their reserves to cover their mortgages — which they may not be able to do indefinitely. He added that a wave of resignations could create “a massive security risk for American travelers” since TSA cannot hire new screeners during a shutdown. It’s one thing to be bothered by the inconvenience of long lines at airports when there aren’t enough TSA agents to process travelers. It’s a more serious safety concern when there are personnel shortages in air traffic control towers. And TSA agents aren’t the only transportation employees on furlough: so are accident investigators who work for the National Transportation Safety Board. That means that the NTSB is having to postpone investigating serious crashes. According to Politico, the NTSB had to put off probes of 12 serious accidents. So far. Those incidents include a tractor-trailer crash with a school bus that injured 15 people and a general aviation crash that killed four. In four other incidents, the shutdown prevented NTSB from gathering enough evidence to even decide whether it should launch an investigation or not. Data not found. The loss of data collection might not cause any personal hardships now, but the lack of such data will hurt us all in the long run. Pew Research has a compilation of all the agencies that have stopped collecting and supplying data, “affecting everyone from investors and farmers to researchers and journalists.” Those include the Census Bureau, statistical offices in the Agriculture Department, the Bureau of Economic Analysis, and more. The Bureau of Labor Statistics is up and running, but it might not have next month’s job numbers because part of its data collection is done with the Census Bureau. The Center for American Progress did a breakdown of how the shutdown is affecting seven states — seven states where Republican senators face re-election in 2020. A few of those senators, such as Colorado’s Corey Gardner and Maine’s Susan Collins, have said publicly that they want to reopen the government without funding Trump’s vanity wall. Another of those senators is Majority Leader Mitch McConnell of Kentucky, who — so far, at least — shows no sign of budging and refuses to let senators vote on the House-passed bill to fund the government. You know — the same bill that passed on a voice vote in the Senate back in December. “More than 6,000 federal government employees in Kentucky are furloughed or working without pay,” says a Think Progress report on the shutdown. What do you say, Mitch? How much are you willing to screw over your constituents just to appease the big baby in the White House? Originally posted on Daily Kos on Jan. 13, 2019. 1914: Ludlow Massacre, the “blackest episode in U.S. labor history”: Colorado National Guard fired on striking coal miners and their families, killing 66. Click Political murder of the day for details. Want notifications about every day’s murder or every post? Follow us on Twitter: @SherSpooner. When a conservative pundit dies at a Washington fundraiser, everyone thinks it’s a heart attack. But environmental activist Laura Delaney and political reporter David Wainwright suspect murder. They also uncover a political bribery scandal, delve into the world of Sunday talk shows, and find a way out of the political correctness mess for the Washington Redskins. Involving potatoes. After environmental activist Laura Delaney finds a body backstage at a political trivia contest, she teams up with Washington political reporter David Wainwright to search online in the worlds of social media and the political blogosphere to find out who committed the murder — and why. Enter your email address to follow this blog and receive notifications of new posts by email. Be sure to CONFIRM the email from WordPress that you want to follow my blog. ‘Democrats must nominate a white guy in 2020.’ Oh, really? Students are leading a worldwide climate strike on March 15. Grown-ups, take note.